A team of federal, state and local law enforcement officials seized nearly $80 million worth of cocaine at Port of New York/Newark Feb. 28. Gaby Acevedo reports. 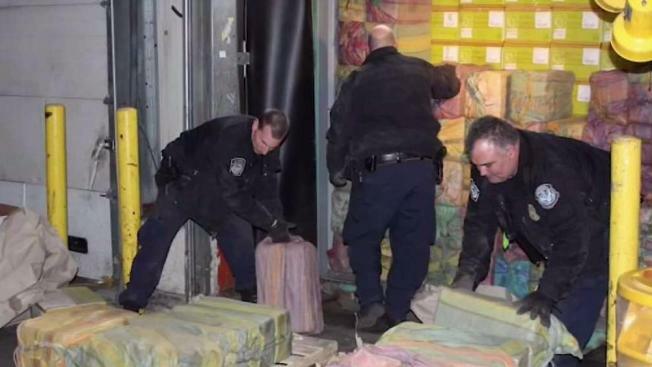 Authorities seized thousands of pounds of cocaine worth nearly $80 million in a monster bust at the Port of New York/Newark last month, the biggest such seizure at the port in the 21st century, customs officials said Monday. The U.S. Customs and Border Protection said its officers, along with a team of local, state and federal authorities, seized 3,200 pounds of cocaine worth an estimated $77,000,000 on the street from a shipping container at the port on Feb. 28. Officials say they found 60 packages with a white powdery substance in the container; a field test showed up positive for cocaine. It was the second-largest cocaine seizure ever at the Port of New York/Newark and the biggest in 25 years, since May 1994, authorities said. Customs officers turned the drugs over to Homeland Security Investigations agents for further probe. There was no information on where the shipping container was sent from apart from outside the United States, and no details on possible people who may have been involved in the trafficking. The DEA, Homeland Security Investigations, NYPD, U.S. Coast Guard and New York State Police were also part of the joint operation. Troy Miller, director of New York field operations for U.S. Customs, said the seizure prevented a "massive quantity of drugs from getting to the streets and in their hands of our children." Those sentiments were echoed by Keith Corlett, acting superintendent of the New York State Police, and NYPD Commissioner James O'Neill, who added, "The proliferation of illegal drugs in New York City will never be tolerated, neither by law enforcement nor by the people we serve."